May 7, 2013 – In a move that had been anticipated for some time by drinks industry observers, Diageo CEO Paul Walsh has announced his plans to step aside on July 1, clearing the way for his top lieutenant to take the reins of the world’s largest whisky maker. Ivan Menezes was named Chief Operating Officer in 2012, and was tipped then as Walsh’s heir apparent. 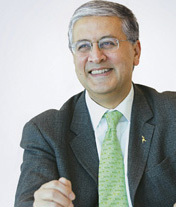 The Indian-born Menezes spent ten years running Diageo’s North American operations before he was named COO, and also chaired the company’s Asia-Pacific, Latin America, and Caribbean operations. While around 40% of Diageo’s sales come from North America, those developing regions are forecast to become a major revenue base for the company. Walsh spent 13 years as Diageo’s CEO, and also served as chairman of the Scotch Whisky Association, where he continues to sit on the SWA’s Council. He will stay on with Diageo for a year to assist with the transition, but will give up his seat on the Diageo board in September and retire completely from the company at the end of June, 2014. His future plans have not been announced, and there has been no word on when Menezes will replace him on the SWA Council.